MURAL ORDINANCE | United Painters and Public Artists (UPPA), is an arts advocacy organization established by Artists to effectively represent and defend their interests. 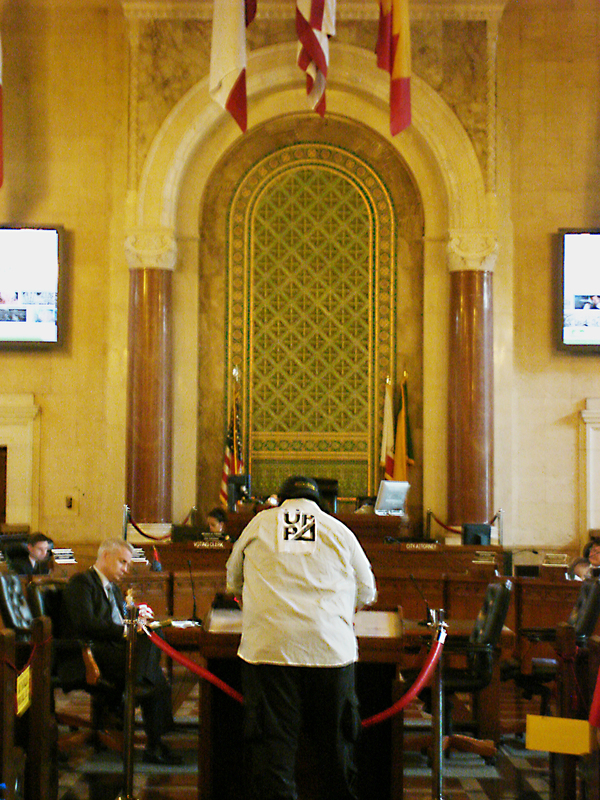 “On July 30, the Planning & Land Use Management Committee of the LA City Council reviewed two versions of the proposed mural ordinance. Version A allows for murals to appear on single-family private residences, while Version B does not. After reviewing the variations, the committee listened to public comment on the issues. While perhaps not surprising, public comment was mixed, with neighborhood councils and home owner’s associations tending to prefer version B, while muralists and other arts community stakeholders tended to support version A. PETITION: NO MURAL BAN ON SINGLE FAM ! There are 15 members on the City Council. 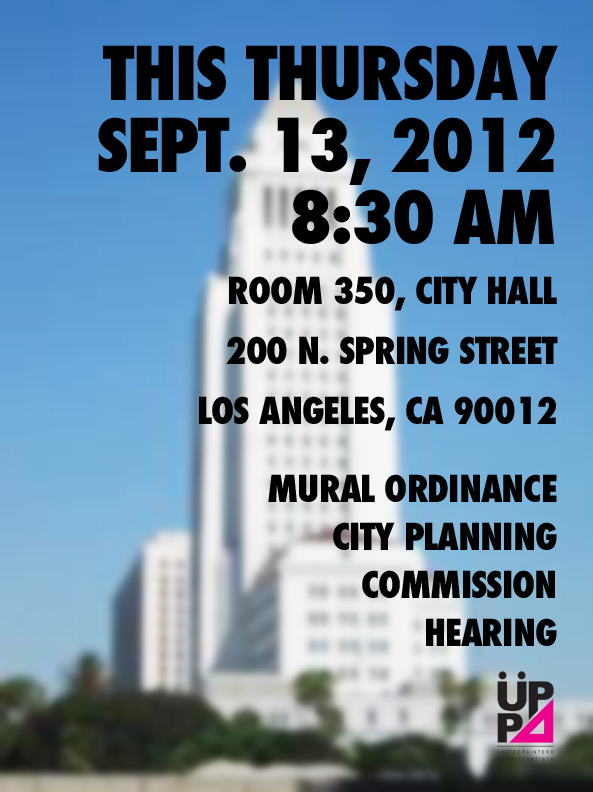 We need 10 council members (not 8, because PLUM sent the mural ordinance to Council without recommendations) to pass the mural ordinance in 2013! 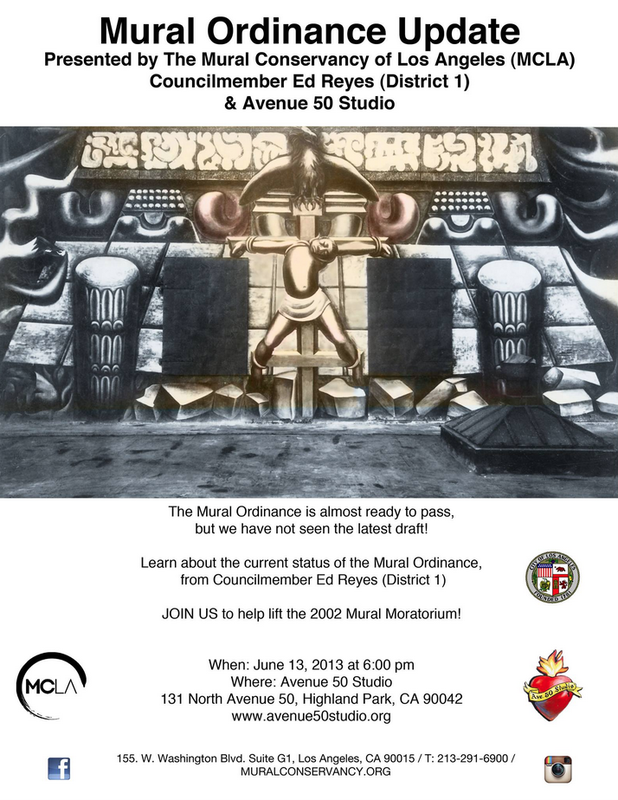 Tell them you want this ordinance passed to finally legalize murals in the City of LA! See below…. The Planning Commission approved the Planning Department’s request to move the issue to next month, October 11th (tentatively). 1. The Planning Department was not confident that they developed an ordinance that the Planning Commission will support. 2. The significant opposition by a city wide alliance among artists and muralists at the July 12th Planning Commission Meeting was effective. 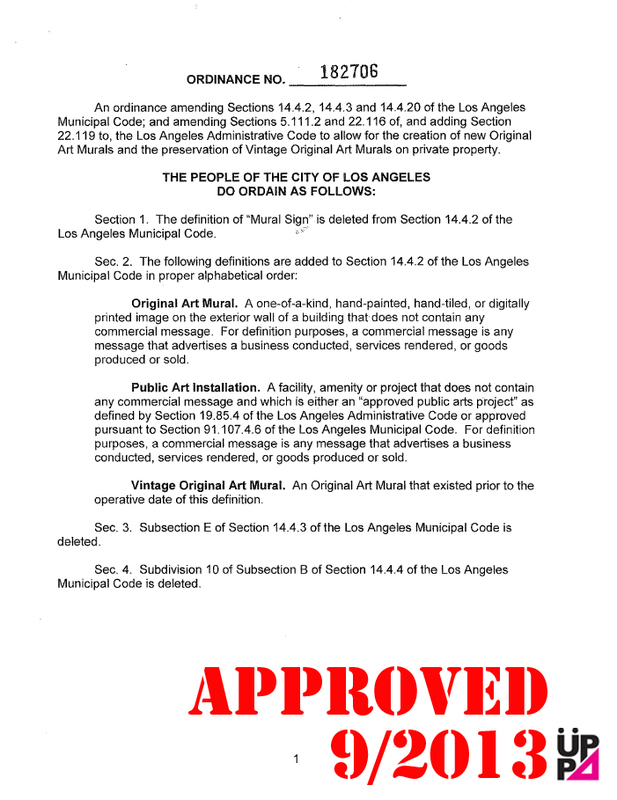 This means all Council districts need to be lobbied to advocate the 1st Mural Ordinance Draft formally presented to the Cultural Affairs Department in March 2012 which has the city wide consensus by our alliance. Here is a link to get in contact with the council districts. 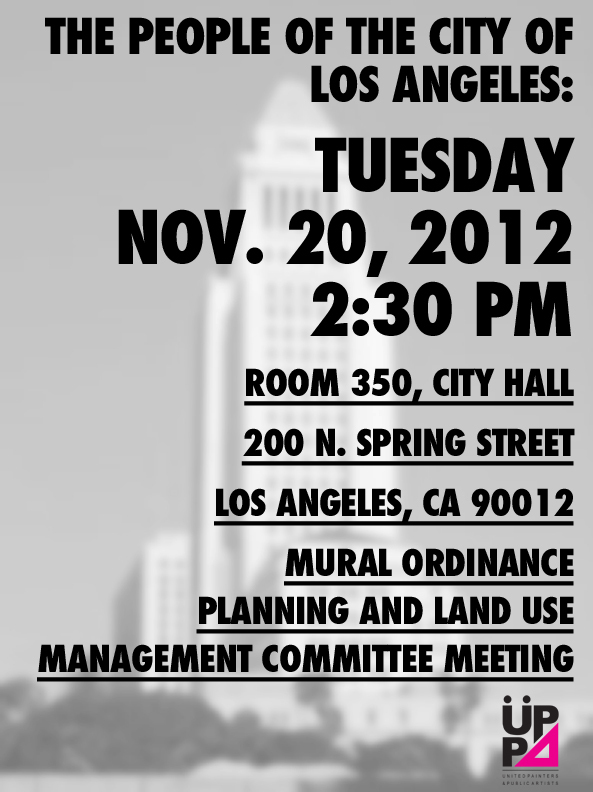 Thank you all who are supporting this effort to create a fair and reasonable mural ordinance for the City of Los Angeles! Let’s keep it going! 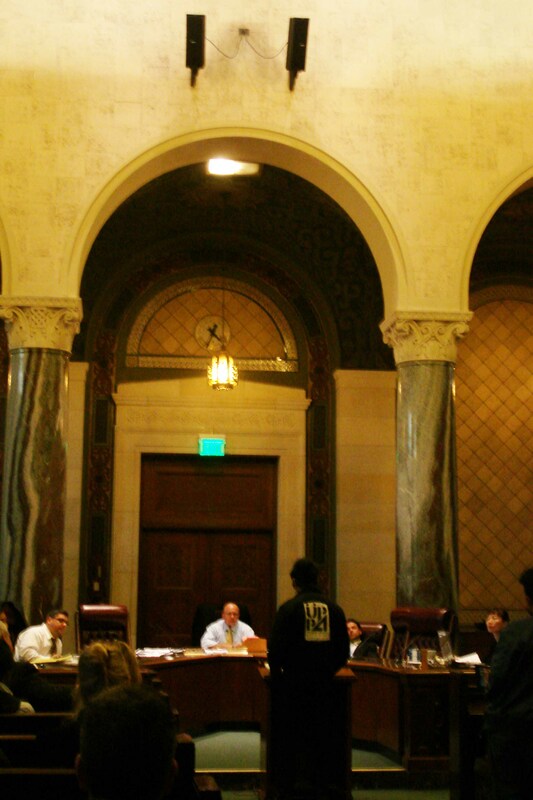 This IS the most significant public policy affecting artists in LA city. We need to remain vigilant of the Planning Commission and Planning Department. Our efforts to lobby the City Council is EFFECTIVE. Keep it up!!! 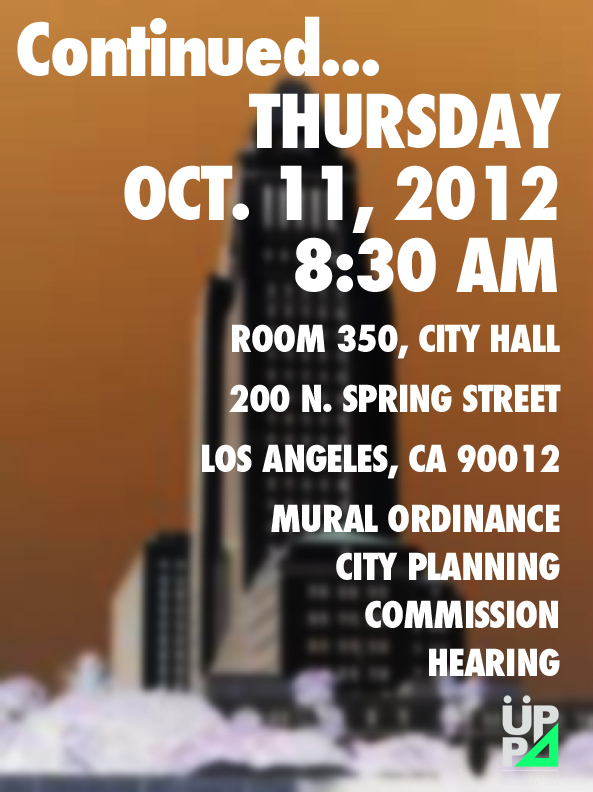 Please find the time to make it tomorrow morning 8:30 to City Hall. If you wish to speak to the committee, you must arrive early and get a speaker card to fill out.